Probably the number one question I get from both sailors and land lubbers about sailing with a baby is, “So how do you diaper your baby?” I thought about this question long before anyone asked me. 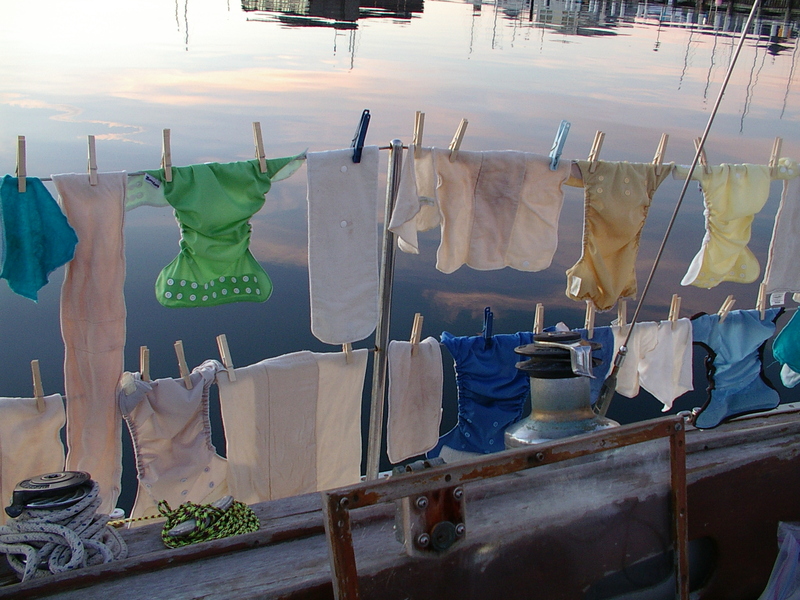 I was dedicated to using cloth diapers on my child while living on land, so it made sense to carry on using cloth diapers while living on a boat. Cloth diapers are more cost effective than disposable diapers. Even taking into consideration that I sometimes have to wash diapers at the Laundromat. Where am I going to store all those disposable diapers on the boat? Storage space is at a premium and I didn’t want to “waste space” by storing disposable diapers. Many disposable diapers are non biodegradable. I think about the disposable diapers that I was in when I was a baby just sitting in the landfill probably as intact as they were when my mom threw them out. Cloth diapers are just so cute! I love the colors and prints of cloth diapers and I love how Capt’n in Training looks in his cloth diapers. I admit cloth diapers are not cheap to purchase. When money is tight, it can be difficult spending $20 on one cloth diaper when you can use that $20 to buy two packs of disposables. But to minimize the large upfront cost to cloth diapering, I bought many of my diapers off of Craigslist. I lived in an urban setting before venturing off into the great blue sea, so there were many advertisements selling cloth diapers and I did not have a problem finding second hand diapers. I love Craigslist and have gotten so many good deals. One of the best deals was purchasing one dozen organic prefolds, four covers, and snappis for a fraction of the retail cost! The other diapers I bought were either seconds, or on sale. Some websites have promotions that you can purchase diapers and earn point s to go towards free diapers. In addition, I also use cloth wipes. I figure that I am already washing cloth diapers, why not also wash cloth wipes as well – there is no extra work. I purchased my cloth wipes used on Craigslist and also on a website that was selling seconds. I also made my own by cutting and sewing flannel squares. Since I use reusable wipes, I also make wipe solution. There are so many recipes out there on the World Wide Web…. Add olive oil (not much – but I do not measure it), a few squirts of Capt’n in Training’s soap/shampoo, and water to a water spray bottle. And shake. I simply spray Capt’n in Training’s bottom with the solution and wipe him with dry wipes. It seems to work really well for him. So how do I store these diapers when they become soiled? Great question. I purchased two large wet bags for storing soiled diapers. These wet bags have two layers: one inner waterproof layer and an outer cloth layer. The inner layer is supposed to keep any moisture from escaping and the other cloth layer makes the bag look pretty. I have used these bags for about 20 months and they have definitely seen better days, so I am in the market for new ones. To remove soiled diapers the method changes depending on where we are. If we are sailing far enough from shore, I throw the poop into the ocean. Of we are docked or anchored, I throw the poop in the toilet before putting the diaper in the wet bag. To minimize the odor of the diapers once they are in the wet bag, I use a scented powder from Rockin’ Green. My washing method also depends on our location. My preferred method to wash diapers is to use a friend’s residential washing machine. This way I can spend time with a friend and save money by washing diapers for free. If I am in a town where we do not know anyone, I either go to the Laundromat, or use a marina’s laundry facilities. When I would go to a Laundromat, I would first rinse out my diapers using a bucket and some cold water. I would then rinse out the diapers and take them to the Laundromat. I would run the diapers through two cycles. 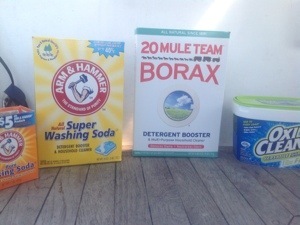 The first cycle is a hot wash cycle, using half of recommended laundry detergent, followed by a cold rinse, or wash cycle using white distilled vinegar. I would hang dry the diapers on our life line on the boat. I am currently at a marina where the cost to wash is relatively cheap so I actually run the diapers through three cycles. The first cycle is a cold wash (I cannot select rinse only). I add ½ Tbsp of my laundry detergent to offset the odor. The second cycle is a hot wash cycle using 1.5 Tbsp detergent, and the third cycle is a cold wash cycle using white distilled vinegar. Unfortunately this marina does not allow you to hang dry laundry on your boat, so I have to put the diapers through the dryer. I purchased felted wool dryer balls off of Etsy.com and throw those in the dryer with the diapers to cut the drying time. On really nice days I will take the diaper covers and lay them to dry in the cockpit. But we don’t always have the luxury of washing machines, so we have to find creative ways to wash diapers. Before we moved on our boat, we purchased a hand crank washing tumbler called, “Wonder Wash.” You basically put clothes in the tumbler, add detergent and water, seal the washer and tumble the canister for a few minutes. Then drain the canister, refill with clean water, tumble again and drain. This machine does not spin so you have to manually rinse the clothes and then hang dry. If you purchase this machine, I highly recommend purchasing a devise to wring out the water from your clothes. When I used this devise to wash cloth diapers I would first rinse the soiled diapers in a bucket of cold water before washing them in the wonder wash. This method is very time consuming and uses a lot of muscles and I found it to be difficult as my only washing option. It also uses a lot of fresh water and we do not have a water maker. We would catch rain water and use rain water to wash clothes, or fill collapsible 5 gallon water jugs when we were at shore. 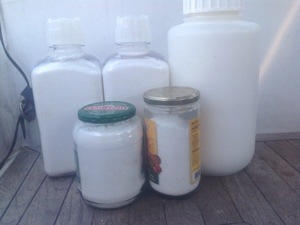 I also make our own laundry detergent that I use for both cloth diapers and our own clothes, and I will post the recipe in a couple of days. I hope these explanations were helpful for those of you thinking about living on a boat with children still in diapers. Hanging diapers on our life line in Newport, Rhode Island. The last few weeks have been a bit crazy at Dominion. We moved our boat, we found out our dog is suffering from kidney failure, Capt’n got a job and then laid off six weeks later, and I am sure there are more things that I can think of. So needless to say this blog has been the last thing on my mind. But here is a (not so brief) update. I don’t think that I mentioned where we are currently docked…we are in Cocoa Florida. We moved up to Cocoa from our anchorage in Indian Harbour Beach because Capt’n was offered a full time diesel mechanic position. We thought this would be a good opportunity to refill the cruising kitty and try to pay down my student loan (will it ever go away?) To make a long story short, Capt’n got laid off about six weeks after the job (very fishy to me, but I will not speculate on the reasons here). 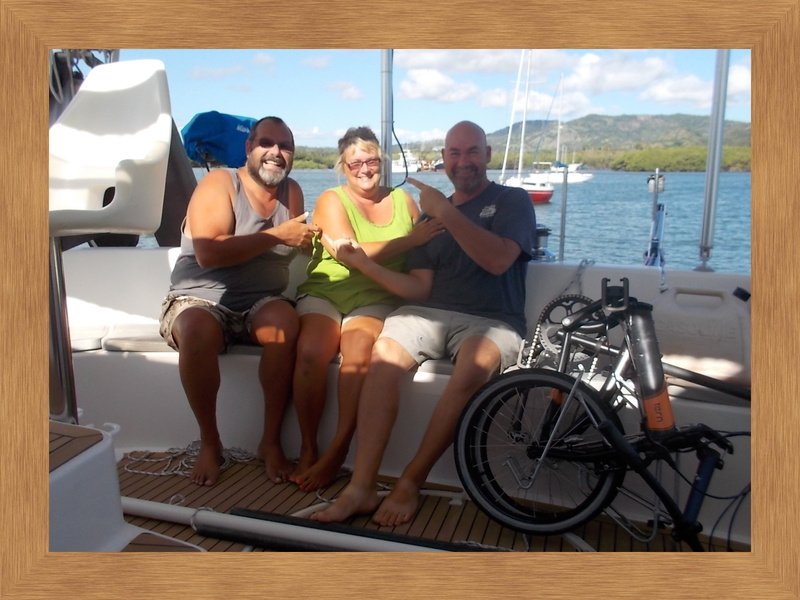 While he was wondering what to do next, we received a phone call from a friend who was in Turks and Caicos and wanted to know if Capt’n wanted to go sailing with him for a while. Capt’n is never one to say no to a sailing opportunity. We agreed that he would go for 10 days and I would hold down the fort until his return. Now remember, Capt’n in Training is a 2.5 year old firecracker and we also have three Jack Russell Terriers – one who is sick and on a demanding medicine/fluid injection schedule. But I thought – I can handle 10 days. I am a modern independent woman! Well, if Capt’n was a writer I would totally have a he said/she said segment to this blog because we had two completely opposite experiences. I will start off with my 10 days (turned into about 20 days) without Capt’n. At first I thought it would be fun to be alone with Capt’n in Training and do whatever I wanted to do. And to a degree I was right. Tim’s friend rented a car for me so I was able to drive around Central Florida. On that Sunday, we met our niece at Downtown Disney for lunch and a fun afternoon. We ate at T Rex Cafe and Capt’n in training was so excited that he couldn’t even eat a bite of his ribs for lunch! 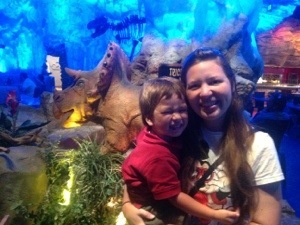 We enjoyed checking out all of the dinosaurs. Stephanie ordered the burger and I ordered the fish tacos. All of the reviews that I read said that you don’t go to T Rex Cafe for the food, but rather for the experience. Well, I thought my fish tacos were delightful. And Capt’n in Training loved his ribs. He ate every single one once we got back to the boat. We had a great rest of the afternoon looking at lego land, sharing a sundae at Ghirardelli (which reminded me of the vacation I took to San Fran in 2002 with two of my friends!) Downtown Disney was basically the highlight of Capt’n’s time away from us. The day Captn left I decided to take our 10 year old Jack Russell to the vet because he was not looking good. His health has been slowly declining and we had reached the point where we could not justify his health anymore. So I took him to the vet for him to be diagnosed with kidney failure (a chronic, fatal disease). Great. He was given about five different types of medicine and saline solution I had to give him in his subcutaneous tissue. Now for someone who can’t stand needles, or even give blood, I could not believe that I had to stick a needle in my dog, every day! And all of this happened on day 1 of Capt’n leaving. What had I gotten myself into? We spent the rest of the time taking care of Rolly, keeping Capt’n in Training occupied and working on small boat projects. I say small because I only have about 2 – 3 hours a day (during Capt’n in Training’s naptime) where I can work independently. I cleaned or navigation station (which turns into our dump and run spot – where we put all of our “junk.” I decluttered and deep cleaned the cockpit. And the project I am most proud of is putting up lifeline netting on the entire port side of the boat. We have had lifeline netting from the bow of the boat to the entrance where you walk on the boat, but not the stern. Now that we are at the dock and I want to keep the dogs up on deck (and for Capt’n in Training’s safety, of course), I wanted to finish installing lifeline netting so the dogs (and the toddler) cannot get off the boat. It took me about two days (two nap times) and I finally finished. Granted, I looked like a fool putting up lifeline netting in a skirt and tank top but there was no way I was going to go into the aft cabin to change and jeopardize walking up Capt’n in Training. So after flashing just a couple of people, and suffering only a minor sunburn, we are now reaping the benefits of this lovely lifeline netting. Now Capt’n was in the Dominican Republic and he didn’t bring a tablet or laptop, so he had to rely on our friend’s computer in order to communicate with me. Well Capt’n rarely had the chance to get his laptop so I didn’t hear from him often. We were in about day 7 and I am getting into a routine and dealing with being a single mom a bit better when I get a voicemail message from a friend we met in St. Augustine. 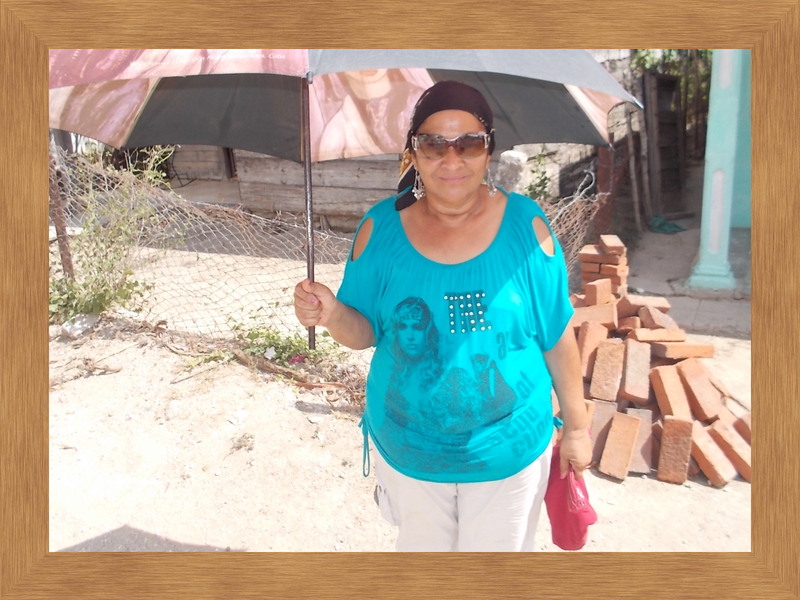 They are now in Luperon, DR. Her message said that she met Capt’n in the anchorage and I swore the message said he would be another 10 days. I almost had a breakdown. I quickly emailed/skyped/facebook messaged her to get an accurate time and thank God she said an additional 5 days. OK, I can handle this I say to myself. But a few days later finally get a phone call from Capt’n. 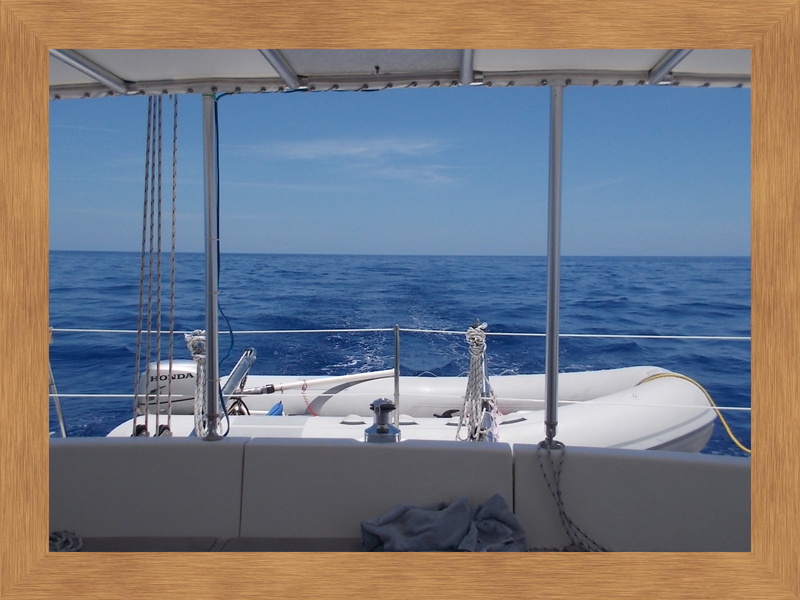 They are in the middle of the ocean and he is only sailing at 2.5 knots and honestly does not know when they will make it to Florida….and then I had a real breakdown. I am learning what my limits are, and I had certainly reached mine! Finally over two weeks after we dropped Capt’n off at the Orlando airport, I get a phone call and they made it to Marathon, Florida! Well, I got the crew together and put them in the rental car and six hours of driving (in Memorial Day weekend traffic) we finally had our reunion! I was looking forward to spending time in the Keys while Capt’n was going to work on our friend’s boat (the reason why he went on the trip in the first place). But life sometimes has other plans. We ended up leaving the Keys on Tuesday instead of Friday and work had not been completed. We are still working out the emotional drama that happened, but the important thing is that Capt’n is home safe and back with his family. Phew! I am so thankful that the family is back together again. Capt’n’s story is a little different. He spent almost seven days in the DR, eagerly awaiting the sailing voyage to Florida. Capt’n did enjoy seeing Puerto Plata. He loved the change of scenery, and it was a nice and relaxed place.They stayed at Oceanworld Marina, which had a Sea World type park adjacent to the marina. 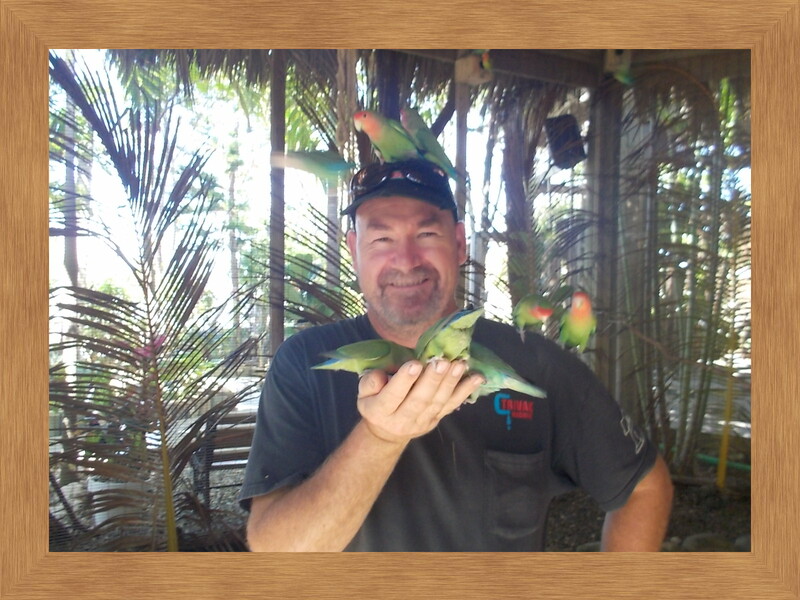 Capt’n and the lovebirds at Oceanworld in Puerto Plata, Dominican Republic. But spending seven days there was a bit long for him – so after threatening to fly back home, they finally left…..for Luperon, DR. 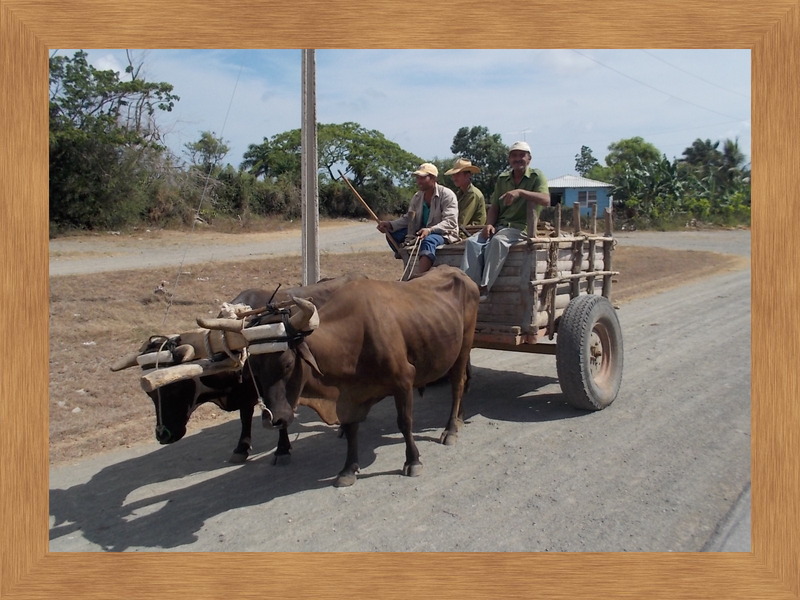 I think they had a late start leaving Puerto Plata, so sailed overnight to Luperon. When Capt’n woke up, he looked around the anchorage and saw some friends who we met in St. Augustine Florida. In true Capt’n form, he starts whistling and yelling to get our friend’s attention. A few minutes later, out comes Jack and John! They couldn’t believe that they saw the Australian Cowboy (their nickname for Capt’n). They immediately got into their dignhy and came over to the boat. They were glad to see Capt’n but disappointed that Capt’n in Training nor I were there (ahhh, thanks!) They had a nice reunion and then off Capt’n went for another sailing adventure. John, Jac, and the “Australian Cowboy” at the anchorage in Luperon, Dominican Republic. They stopped in at a few more places, met some lovely people, and then the winds stopped…completely. They were in the middle of the ocean sailing at 2.5 knots. Capt’n finally got the boat Captain to put on the engines so they could go a bit faster! They finally made it to Marathon on a Friday, ready to go to Key West to get hauled out. But of course it was Memorial Day Weekend and they could not get hauled out until Tuesday. And then you have the two stories meet. A local Capt’n met along the way. So I am really glad that Capt’n got to go sailing on a nice trip (they sailed over 700 miles), on a beautiful boat, but I am not sure I can cope with him being gone again. 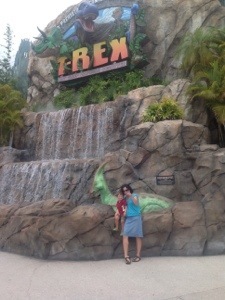 Here are two photos from T Rex cafe. Capt’n in Training loves dinosaurs!